Primary or metastatic neoplasia involving the central nervous system (CNS) is unique in being potentially life threatening due to the associated rise in intracranial pressure and involvement of critical or eloquent structures. When faced with a crucial decision to maximize the clinical benefit while keeping the therapeutic deficits to a minimum, neurosurgeon often resorts to a stereotactic biopsy as the diagnostic procedure. The neuropathologists are thus often required to make the diagnoses on very small biopsy specimens. During intraoperative consultation, neuropathologists are expected to render diagnosis that can not only suitably modify the surgical procedure, but also ensure maximal preservation of lesional tissue for definitive diagnosis on formalin-fixed paraffin-embedded (FFPE) sections. 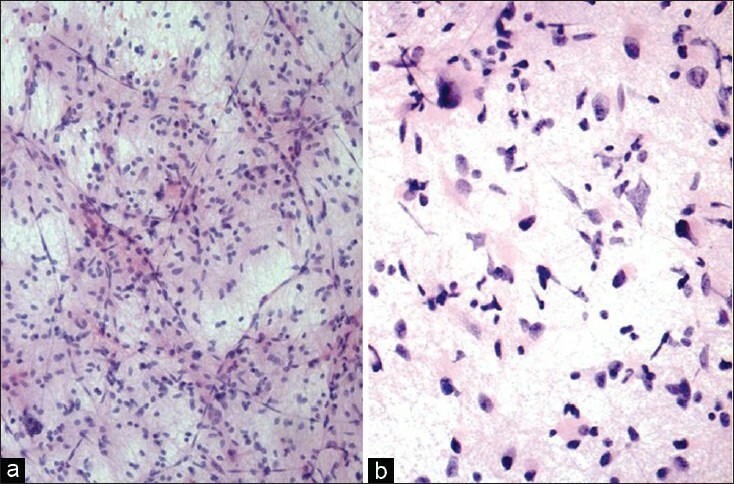 Of the two intraoperative pathologic techniques, frozen section is superior to cytologic preparations in providing both histologic patterns and cytomorphology, yet is not often suitable for small brain biopsies as it provides a limited view of the sample, wastes substantial tissue and causes freezing artefacts rendering the tissue suboptimal for FFPE evaluation and special stains. 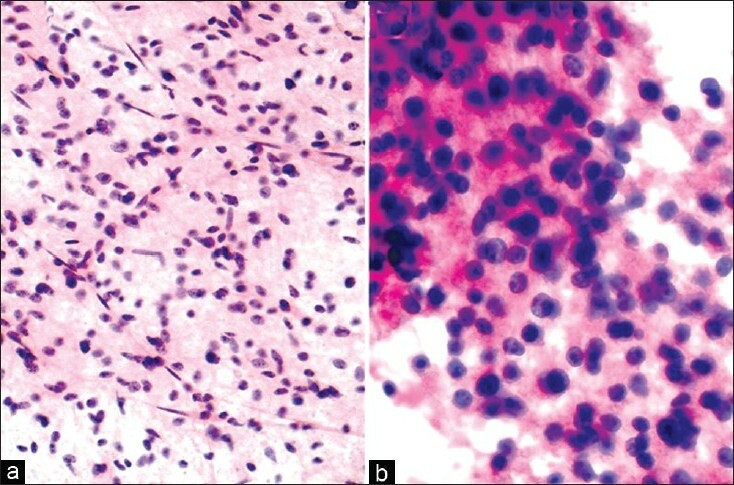 Cytological methods, particularly smear  or squash  preparations and sometimes touch preparations [1,2] are in some ways better suited for intraoperative diagnosis of tiny stereotactic brain biopsy specimens ,,,,,,,, so long as their limitations are fully understood by both neuropathologists and neurosurgeons. ,,,,,, In general, cytologic preparations are faster to prepare and provide invaluable nuclear detail but due to variation in smear thickness, cellular overlapping, and stretching take longer time to examine. ,, This review is intended to facilitate and expedite the intraoperative smear-based diagnoses of CNS neoplasia. The importance of intra-operative pathologic diagnosis is mainly six-fold. ,, In the vast majority of cases, the neurosurgeon's main reason for intra-operative neuropathologic consultation is to ensure that a diagnostic specimen was obtained in the least invasive manner and with the fewest complications. This is especially important for lesions in brainstem or in other locations with a high-risk of hemorrhage where only a single biopsy may be possible. Second, if the smear diagnosis is an infection or lymphoma; to make sure that additional biopsies are submitted in adequate quantity for microbiologic or flow cytometric studies respectively; an infectious disease specialist or hematologist-oncologist on duty are immediately contacted to ensure institution of or modification to appropriate medical treatment. For these two purposes, an intra-operative cytological examination has indeed been reported to be an excellent method. In one study, tissue adequacy of a specimen could be confirmed with 96% sensitivity and 75% specificity rates. Third, given that even a relatively broad intra-operative diagnosis, such as glioma, may likely to reflect the periphery of a high-grade glioma if suggested by imaging features, the neurosurgeon can decide to proceed with obtaining a deeper biopsy to include the more cellular and/or necrotic portion of the tumor based on which the FFPE diagnosis can be further narrowed to a glioblastoma. Fourth, in a select group of cases, intraoperative diagnosis may influence the extent of resection or adjuvant therapy of lesional brain or spinal cord parenchyma. For example, if the diagnosis of a high-grade glioma, lymphoma or infection can be ascertained intra-operatively, adjuvant therapy may be instituted at the time of the surgical procedure or in the immediate postoperative period. Similarly, detection of lymphoma in a ring-enhancing brain lesion or a pituitary adenoma in clinically suspected Cushing's disease would limit the surgery and prevent the unnecessary resection. Fifth, an accurate and specific intraoperative diagnosis may be obtained in few of the cases, who may be offered immediate medical or surgical treatment, while in most cases, the neurosurgeon has to wait for and rely on FFPE sections that is available the next day. However, an intra-operative pathologic diagnosis is nevertheless of great interest and emotional value to the anxiously waiting patient and family besides serving the professional satisfaction of neurosurgeons. Finally, smears can be readily used for diagnosis in case the facility or trained personnel for frozen sections are unavailable. Low-grade CNS neoplasms can be diagnosed on cytologic preparations within certain limitations. Smears are particularly helpful in highlighting glial fibrillary architecture. Diffuse astrocytoma typically infiltrates normal brain therefore shows an admixture of neoplastic and normal glial cells. Therefore, the diagnosis of diffuse astrocytoma should only be based on identification and analysis of a significant population of atypical glial cells but not by pointing at single cells. Typical features include hyperchromatic nuclei with irregular often 'sausage-shaped' nuclear outline, coarse chromatin, with/without gemistocytic phenotype embedded in the background of a meshwork of glial fibres [Figure 2]. 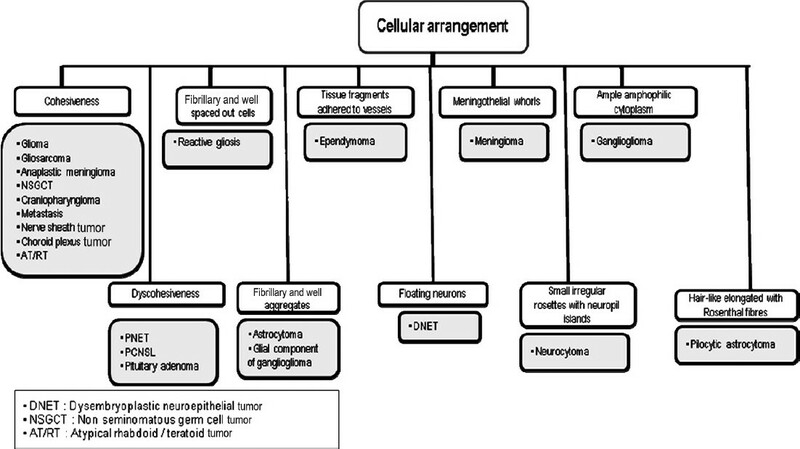 In contrast, oligodendrogliomas typically have relatively rounded, smoother and monomorphic nuclei [Figure 3]. The differences in nuclei decrease with increasing histologic grade. While many nuclei may be devoid of cytoplasm, raising the differential diagnosis of neurocytoma, lymphoma and metastatic small cell carcinoma in such cellular foci on low-power, the presence of relatively bland chromatin, mini-gemistocytes and some glial strands on high-power help ascertain the diagnosis of oligodendroglioma. Peri-nuclear halos that give oligodendroglioma the 'fried-egg' appearance on FFPE sections is an artefact of fixation and not present on smears. Calcification when present may be a helpful feature. It is important to differentiate a low-grade ependymoma from a diffuse astrocytoma as the former is typically treated with gross total resection. On cytologic preparations, a low-grade ependymoma typically shows monomorphic population of round cells with salt-and pepper-like chromatin and detectable micronucleoli in fibrillary background. Due to these glial features and sometimes eosinophilic cytoplasm, ependymomas may resemble astrocytoma on smears. 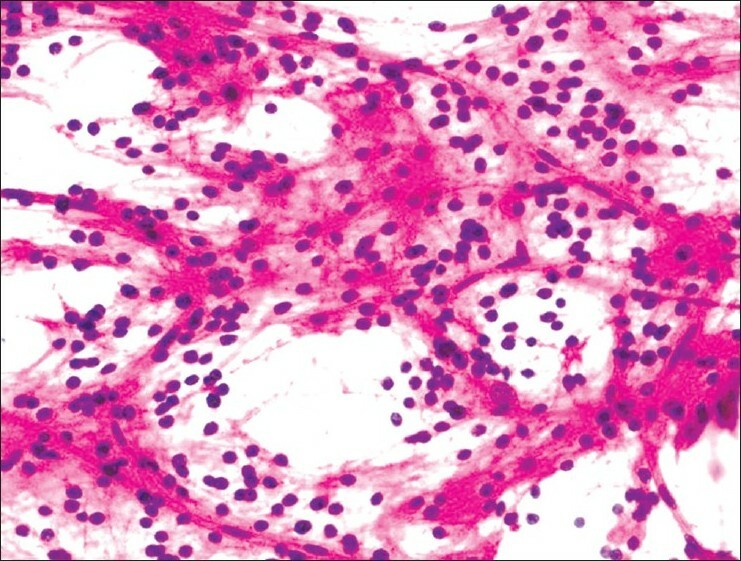 Therefore, the arrangement of tumor cells encasing blood vessels variably separated by perivascular cell-free zones of fibrillary processes (perivascular pseudorosette) are essential to the diagnosis of ependymomas on both smears and frozen sections [Figure 4], especially in the clinical context of ventricular or periventricular tumors. , A delicate smear may preserve the myxoid lakes or spheres of myxopapillary ependymoma, especially on Diff-Quick stain. 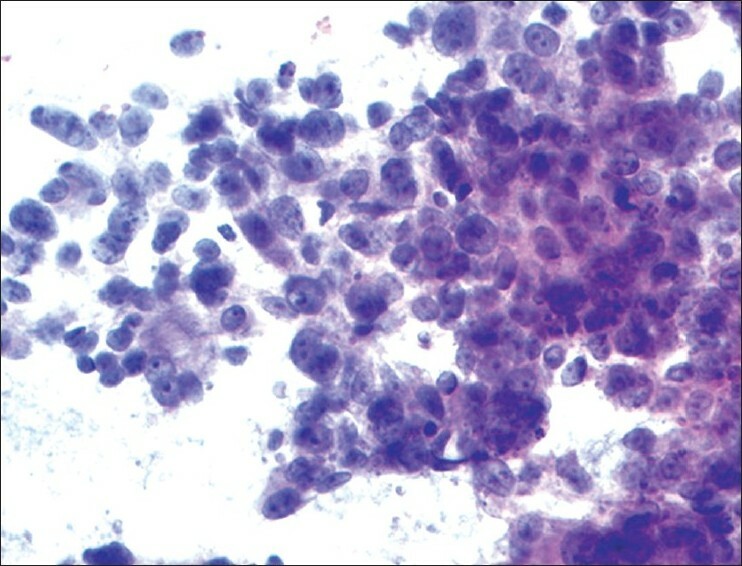 Smears of dysembryoplastic neuroepithelial tumor (DNET) usually show a diagnostic combination of cytologic features. These include small uniform neurocytic cells with delicate capillary vasculature and myxoid microcystic architecture. Admixed are large ganglion cells present variably admixed and sometimes floating within the microcysts similar to histologic sections [Figure 5]. If additional gliomatous patterns are present, the tumor is classified as complex DNET which may raise the differential diagnoses of pilocytic astrocytoma, oligodendroglioma or ganglioglioma. Non-germinomatous germ cell tumors typically occur in young adults and can have a variety of cytomorphology depending on the subtype present or preponderant. The teratomas may be mature and include mature differentiation of ectodermal, endodermal or mesenchymal patterns, or have immature, fetal or embryonic appearance. Anaplastic epithelial clusters of large cells with prominent nucleoli and necrotic debris suggest an embryonal carcinoma. The presence of mucoid microcystic matrix and anastomosing thin clusters of anaplastic cells may suggest yolk sac tumor. 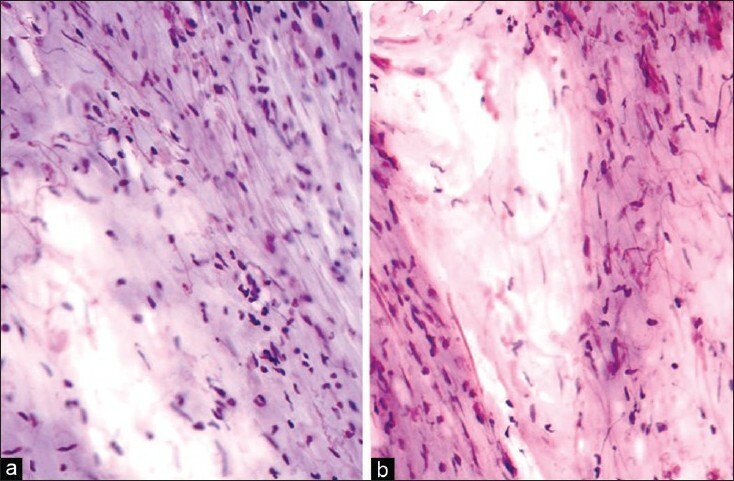 An epithelial neoplasm with varying degrees of anaplasia with/without papillary pattern in a child in ventricular/periventricular region may represent a choroid plexus carcinoma. Anaplastic meningiomas can be cohesive and show a variety of patterns and cytomorphology yet show at least some evidence of meningothelial differentiation such as focal whorls and/or typical nuclear features. However, typically meningothelial cells do not show distinct cell borders. Rarely epithelioid glioblastomas or gliosarcomas can show cellular cohesion yet there is an evidence of at least focal glial differentiation, such as glial processes or gemistocytes, typically highlighted by immunostain for GFAP. 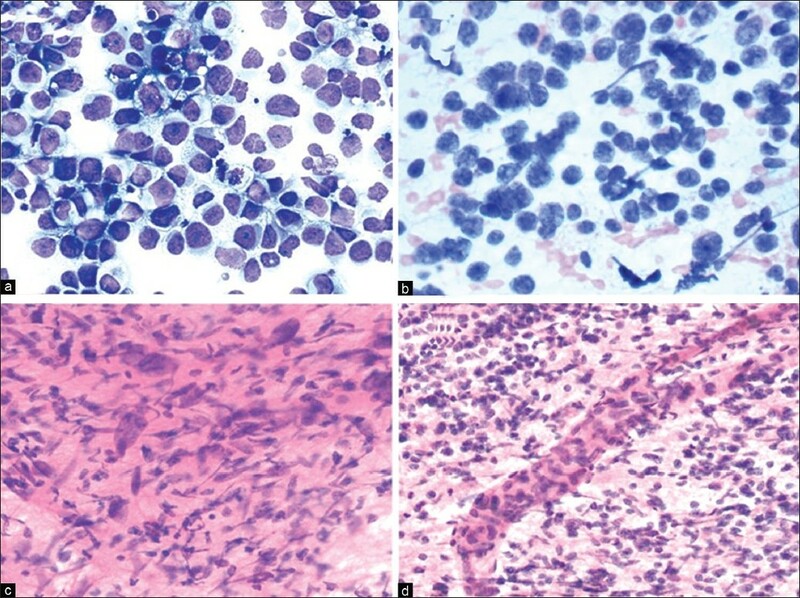 (B) Discohesive or loosely cohesive tumor cells: In contrast, if a smear or touch preparation shows numerous large atypical discohesive cells, the possibilities are more diverse ([Figure 7] panel). a. Relatively monomorphic discohesive cells: Main possibilities are as follows. The presence of relatively monotonous large, discohesive cells with scant to moderate bluish cytoplasm and prominent nucleoli in the background of dispersed lymphoglandular bodies on Diff quick suggests primary central nervous system lymphoma (PCNSL). Cytologic preparations are often superior to FS in this regard. In such cases, the surgical procedure is brought to a halt and an additional biopsy if any required is only obtained to ensure that an adequate tissue can be submitted for FFPE sections and flow cytometry to establish the lineage, clonality and immunophenotyping; and for cytogenetics if considered necessary. Germinomas can appear relatively monomorphic on smears and are composed of large cells with distinct borders with/without cytoplasmic vacuolation, vesicular nuclei and prominent nucleoli at times with admixed mature lymphocytes. The sycytiotrophoblasts may be seen admixed. 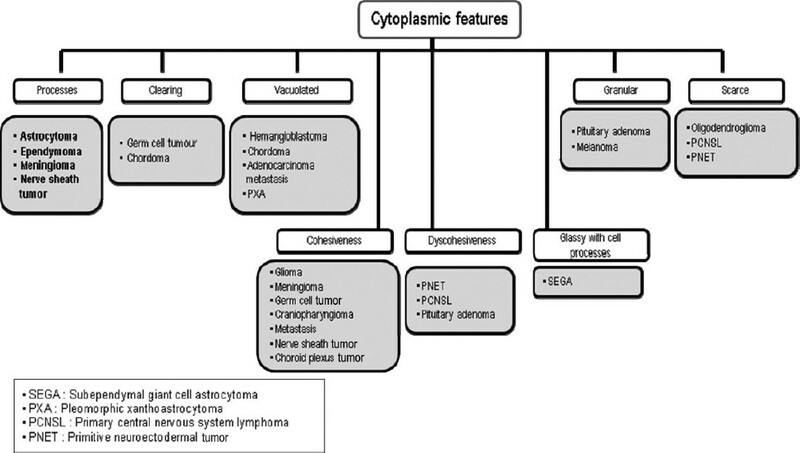 In the context of 'primitive' cytology, the presence of ependymoblastic rosettes and lack of fibrillary processes may suggest ependymoblastoma, whereas the epithelial appearance with gland-like features and canals with/without glioneuronal, epithelial and mesenchymal differentiation suggest a medulloepithelioma or immature teratoma. These diagnoses are seldom made on smears alone and usually need concomitant FS. i.The smear should be carefully evaluated for any evidence of glial, embryonal or neuronal lineage typically in the form of fibrillary processes (not explainable by smearing artefacts). High-grade diffuse gliomas of either astrocytic or oligodendroglial lineage tend to produce clumps of cells. However, smear due to shearing effect is an insensitive method to recognise mitoses that is the most important criterion for diagnosis of high-grade in gliomas. Moreover, recurrent treated tumors are often more anaplastic yet have fewer mitoses than primary tumors. An anaplastic oligodendroglioma typically shows relatively rounded cells, mini-gemistocytic cells, sparse fibrillary processes, suggestive of infiltration of gray matter and none to variable micro-vascular proliferation. In cases where the glial lineage is uncertain, it is reasonable to offer a diagnosis of 'infiltrating or high-grade glioma' on intra-operative smears as it may not alter immediate surgical management in most cases. Metastatic poorly differentiated non-small cell carcinoma. Further evaluation is often not possible on smears and requires immunohistochemical work up on FFPE including cytokeratin (CK) - AE1/AE3, 7, 20, (thyroid transcription factor)TTF1, estrogen receptor (ER) and progesterone receptor (PR). Undifferentiated examples may need Ber-EP4 or MOC31 to establish the diagnosis of carcinoma. Metastatic or meningeal melanoma. Diverse cell morphologies and melanin pigment are useful clues to diagnosis. Immunohistochemical work up should include S-100, HMB45, Melan-A and tyrosinase (preferably a cocktail). Rhabdoid tumors including ATRT in children and rhabdoid meningioma in elderly. In pediatric, especially, infratentorial tumors, increased nuclear pleomorphism, large cells with open chromatin and more distinct nucleoli with or without obvious rhabdoid cells suggest ATRT. , This is especially the case in cerebellopontine angle in a child younger than two years. Rhabdoid immunohistochemical work up should include cytokeratins, epithelial cell antigen, desmin, S-100 and integrase inteactor-1. Molecular testing for both somatic and germline mutations not only confirm the diagnosis, but also provide option of family counselling. Difficulty in the estimation of cellularity: , usually thick smears lead to overestimation of cellularity whereas underestimation is possible on touch smears. This is relevant because an erroneous diagnosis of high-grade glioma may prematurely terminate the surgery in the false belief that adequate diagnostic tissue has been obtained. On the contrary, since gliomas infiltrate the brain parenchyma with decreasing cellularity, even a high-grade glioma can be only mildly hypercellular if sampled at the periphery that may result in undergrading. Mistaking reactive gliosis for low-grade glioma including the periphery of diffuse (fibrillary or gemistocytic) astrocytoma, oligodendroglioma and pilocytic astrocytoma. Pilocytic astrocytomas (PA) can be problematic since Rosenthal fibres are often abundant in gliosis in both the common locations of PA, namely cerebellum and hypothalamus, such as adjacent to hemangioblastoma and craniopharyngioma, respectively. The presence of well-spaced astrocytes with bland nuclei and uniform robust fibrillary processes strongly favor reactive gliosis on smears. Frozen sections and FFPE sections are needed for definitive diagnosis. On the contrary, one must look for evidence of neoplasia in an inflammatory lesion. For example, PCNSL often have an accompanying component of demyelination which may become more obvious following corticosteroid induced tumor regression. Demyelinating features can also be seen in melanoma and post-radiation gliomas. Although rare, a major pitfall on smears can be mistaking pilocytic astrocytoma (grade I) for anaplastic astrocytoma when it has significant nuclear atypia, vascular proliferation and perivascular infiltration. If present, Rosenthal fibres and eosinophilic granular bodies can be diagnostic in favour of pilocytic astrocytoma. Mistaking granular cells of normal cerebellar cortex for a small round cell tumor such as medulloblastoma or lymphoma. Lack of anaplasia, mitosis, apoptosis, and presence of a regular fine neuropil and occasional Purkinje cells are helpful clues. Concomitant frozen section helps resolve this dilemma in most cases. 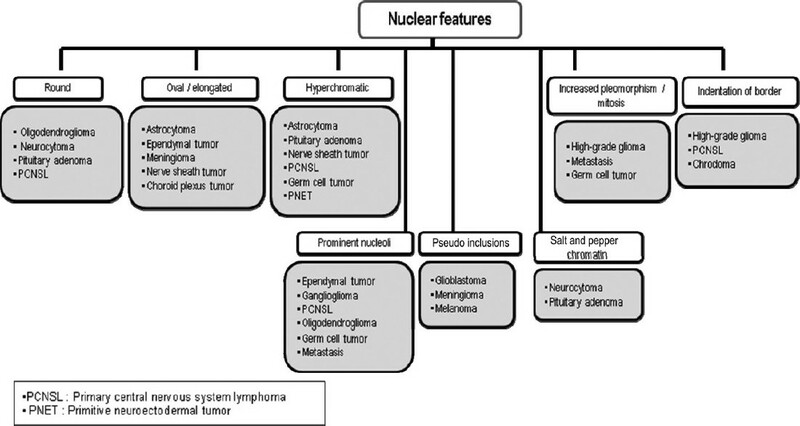 It is important to consider the differential diagnosis of low-grade neoplasms with monomorphic rounded nuclei. In addition to oligodendrogliomas, ependymoma, central neurocytoma (CN) and dysembryoplastic neuroepithelial tumor (DNET) can produce these features on smears. Besides tumor location and imaging features, concomitant frozen sections and FFPE sections are needed for diagnosis. The high-frequency of bare nuclei in oligodendroglioma on smears can raise the differential diagnosis of lymphoma or small cell carcinoma at low-power. Such a potential error can be prevented by a careful evaluation at high-power recognising the bland chromatin, mini-gemistocytes and at least some glial strands in oligodendroglioma. 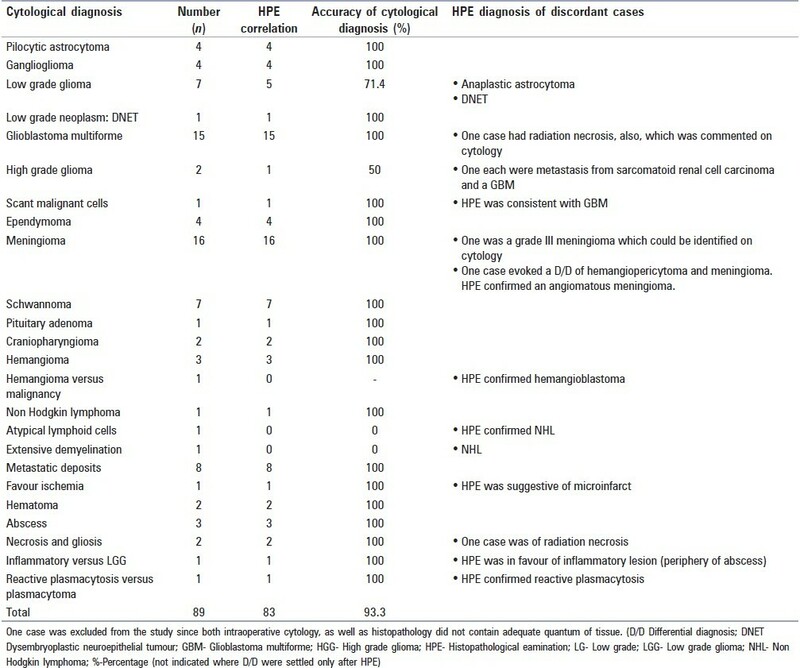 A review of our independent experiences based on recent one year's statistics retrieved from our combined databases revealed a total of 90 cases of CNS neoplasm with intraoperative as well as subsequent FFPE diagnosis [Table 1]. The quantum of tissue received in one case was suboptimal for both methods and hence excluded from the evaluation. Glial neoplasms with 38 cases (42.69%) constituted the majority, followed by 16 cases (17.97%) of meningeal tumors and 8 cases (8.98%) with metastatic deposits. Lymphomas, schwannomas, sellar/suprasellar and vascular tumors accounted for another 17 cases (19.10%). Remaining were vascular/inflammatory/reactive plasmacytosis and reactive gliosis lesions. Concordance between intra-operative cytological and subsequent histopathological diagnosis was noted in 83 out of 89 cases (93.26%). Two cases reported as low grade glioma were subsequently diagnosed as anaplastic astrocytoma and dysmbryoplastic neuroepithelial tumor (DNET). There were two cases of non-Hodgkin lymphoma in which one showed atypical lymphoid cells while the other showed features of extensive demyelination. A case with metastatic deposits from sarcomatoid renal cell carcinoma was signed out as high grade glioma on cytology. A hemangioblastoma was considered to be a hemangioma/low grade malignant tumor in cytology. Finally, neuropathologists should be mindful that they might have to face the challenge of 'unexpected findings' during intra-operative consultations from time to time. It must be kept in mind that the intraoperative pathologic diagnosis may not match the clinical picture at all. We would like to quote two simple examples from our personal experiences. In one case, stereotactic biopsy from an irregular ring-enhancing lesion (radiologically suggestive of glioblastoma) in an elderly showed numerous gemistocytes with mild atypia on smears and frozen section [Figure 8]. On further request, additional biopsies were obtained all of which showed the same features. A differential diagnosis of reactive gliosis versus the periphery of a glioma was considered and final diagnosis deferred to FFPE sections. One FFPE section additionally showed a few neutrophils focally. The final diagnosis favored a reactive inflammatory lesion such as an abscess. However, given the discrepancy with clinical findings, the treating team was only convinced of the diagnosis after the appearance of diffusion restriction on imaging a few days later and after the repeat biopsy showed obvious features of an abscess. In the second example, smear and frozen section from a patient in his fifties with similar radiologic picture showed necrosis and one toxoplasma microcyst. An additional biopsy was sent to microbiology lab and infectious work up began which showed serologic evidence of recent toxoplasma infection but also discovered unsuspected acquired immune deficiency syndrome (AIDS). Based on our experiences, suggested algorithmic approaches to neurocytology are described in [Figure 9],[Figure 10],[Figure 11],[Figure 12]. In summary, intraoperative cytologic evaluation constitutes an effective diagnostic modality, particularly on small samples with the caveat that its limitations must be clearly understood by both neuropathologists and neurosurgeons. It is important to evaluate intra-operative smears in the context of clinical and radiologic findings. This review is expected to provide a simplified approach to intra-operative neurocytologic diagnosis intended to improve the accuracy of surgical and neuropathologists. It is neither intended for beginners nor is it inclusive of the numerous details of individual entities and exceptions which are beyond the scope of this review. For details, the reader should refer to the standardized literature such as the WHO classification of the tumors of CNS,  listed references, review articles on recently described entities in CNS neoplasia and individual reports on rare CNS tumors. Therefore, this approach should only be used as guidelines and each case ultimately treated on its own merit. 1. Adesina AM. Intraoperative consultation in the diagnosis of pediatric brain tumors. Arch Pathol Lab Med 2005;129:1653-60. 2. Brainard JA, Prayson RA, Barnett GH. Frozen section evaluation of stereotactic brain biopsies: diagnostic yield at the stereotactic target position in 188 cases. Arch Pathol Lab Med 1997;121:481-4. 3. Brommeland T, Lindal S, Straume B, Dahl IL, Hennig R. Does imprint cytology of brain tumours improve intraoperative diagnoses? Acta Neurol Scand 2003;108:153-6. 4. Burger PC, Nelson JS. Stereotactic brain biopsies: specimen preparation and evaluation. Arch Pathol Lab Med 1997;121:477-80. 5. Burger PC. Smears and frozen sections in surgical neuropathology. Baltimore: PB Medical Publishing; 2009. p 3-10, 163-287, 335-47, 359-99. 6. Firlik KS, Martinez AJ, Lunsford LD. Use of cytological preparations for the intraoperative diagnosis of stereotactically obtained brain biopsies: a 19-year experience and survey of neuropathologists. J Neurosurg 1999;91:454-8. 7. Folkerth RD. Smears and frozen sections in the intraoperative diagnosis of central nervous system lesions. Neurosurg Clin N Am 1994;5:1-18. 8. Hayden R, Cajulis RS, Frias-Hidvegi D, Brody BA, Yu G, Levy R. Intraoperative diagnostic techniques for stereotactic brain biopsy: cytology versus frozen-section histopathology. Stereotact Funct Neurosurg 1995;65:187-93. 9. Joseph JT. Diagnostic neuropathology smears. Philadelphia: Lippincott Williams and Wilkins; 2007. p. 1-234. 10. Kitchen ND, Bradford R, McLaughlin JE. The value of per-operative smear examination during stereotactic biopsy. Acta Neurochir 1993;121:196-8. 11. Kleihues P, Volk B, Anagnostopoulos J, Kiessling M. Morphologic evaluation of stereotactic brain tumor biopsies. Acta Neurochir Suppl 1984;33:171-81. 12. Louis DN, Ohgaki H, Wiestler OD, Cavenee WK. WHO Classification of tumors of the central nervous system - Lyon: IARC; 2007. p. 10-110, 131-50, 163-204. 13. Martinez AJ, Pollack I, Hall WA, Lunsford LD. Touch preparations in the rapid intraoperative diagnosis of central nervous system lesions. A comparison with frozen sections and paraffin-embedded sections. Mod Pathol 1988;1:378-84. 14. Miller DC, Lang FF, Epstein FJ. Central nervous system gangliogliomas. Part 1: Pathology. J Neurosurg 1993;79:859-66. 15. Miller DC. Modern surgical neuropathology. New York: Cambridge University Press; 2009. p. 5-9, 24-273, 363-98. 16. Ng HK. Cytologic features of ependymomas in smear preparations. Acta Cytol 1994;38:331-4. 17. Ng HK. Cytologic diagnosis of intracranial germinomas in smear preparations. Acta Cytol 1995;39:693-7. 18. Olasode BJ, Ironside JW. The brain smear, a rapid affordable intraoperative diagnostic technique for brain tumours appropriate for Africa. Trop Doct 2004;34:223-5. 19. Oneson RH, Minke JA, Silverberg SG. Intraoperative pathologic consultation: An audit of 1,000 recent consecutive cases. Am J Surg Pathol 1989;13:237-43. 20. Parvani AV, Stelow EB, Pambuccian SE, Burger PC, Ali SZ. Atypical teratoid/rhabdoid tumor of the brain: cytopathologic characteristics and differential diagnosis. Cancer 2005;105:65-70. 21. Plesec TP, Prayson RA. Frozen section discrepancy in the evaluation of central nervous system tumors. Arch Pathol Lab Med 2007;131:1532-40. 22. Powell SZ. Intraoperative consultation, cytologic preparations, and frozen section in the central nervous system. Arch Pathol Lab Med 2005;129:1635-52. 23. Regragui A, Amarti Riffi A, Maher M, El Khamlichi A, Saidi A. Accuracy of intraoperative diagnosis in central nervous system tumors: report of 1315 cases. Neurochirurgie 2003;49:67-72. 24. Robbins PD, Yu LL, Lee M, Stokes BA, Thomas GW, Watson P, et al. Stereotactic biopsy of 100 intracerebral lesions at Sir Charles Gairdner Hospital. Pathology 1994;26:410-3. 25. Roessler K, Dietrich W, Kitz K. High diagnostic accuracy of cytologic smears of central nervous system tumors: A 15-year experience based on 4,172 patients. Acta Cytol 2002;46:667-74. 26. Savargaonkar P, Farmer PM. Utility of intra-operative consultations for the diagnosis of central nervous system lesions. Ann Clin Lab Sci 2001;31:133-9. 27. Sugita Y, Tokunaga O, Morimatsu M, Abe H. Cytodiagnosis of central neurocytoma in intraoperative preparations. Acta Cytol 2004;48:194-8Sharma and Deb: Intraoperative neurocytologySharma and Deb: Intraoperative neurocytology. chaturvedi, s. and pant, i. and dua, r. and gupta, s.